Well, at least it's not called The Complete Psi Files. This big ol' collection--which somehow isn't listed in BARNEY--came out in late 2009, and it appears here in our sequence (as opposed to following Case Files vol. 8) on the strength of the final story reproduced in it: the first Judge Anderson solo story, from the 1984 2000 AD Annual, published around the time of Prog 327. Beyond that, it collects most of the Anderson stories that ran in 2000 AD between May 1985 and December 1991, after which she moved over to the Megazine for a few years. (The "most of" is because "Shamballa," from #700-711, ended up in the Arthur Ranson-drawn collection of the same name.) 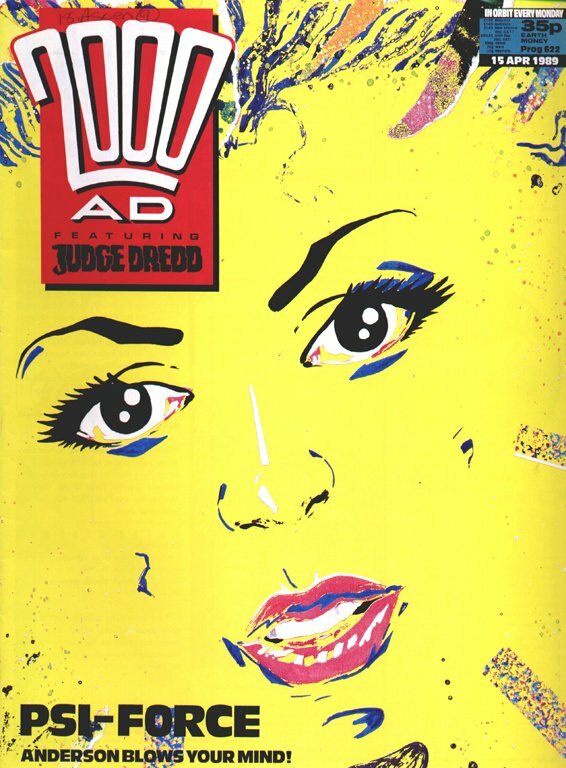 But there were also Anderson comics in 2000 AD Annual 1987 and 1990 and Judge Dredd Annual 1985, 1986 and 1988, and 2000 AD Winter Special 1988, as well as a couple of text stories; none of those appear here. 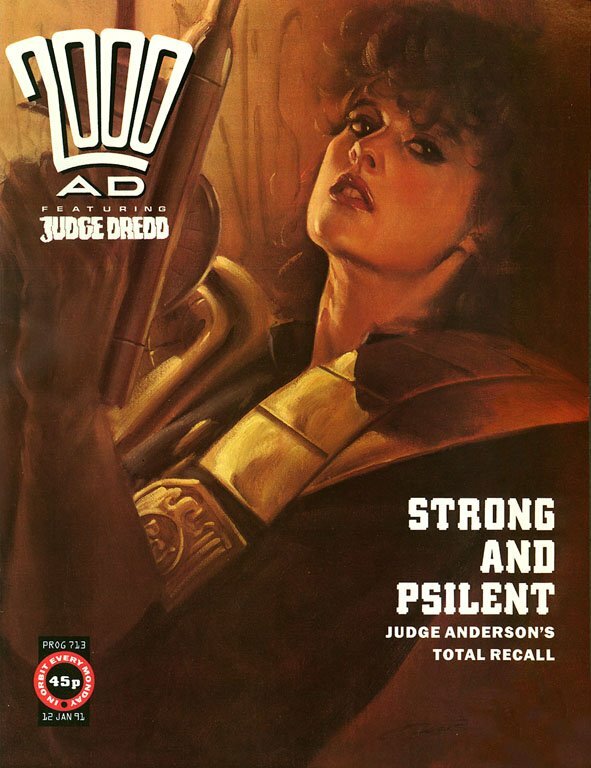 Anderson was very popular as a supporting character, obviously--of all the supporting characters in Dredd's stories she was the one who most seemed like a natural to spin off into her own feature. (It may be less that she's a great character on her own than that she's a great foil for Dredd: irreverent, inexact, emotional, and totally on the same page as he is.) Still, it's not clear to me as a reader why it initially seemed like having a second Judge-based series in the weekly was a good idea. 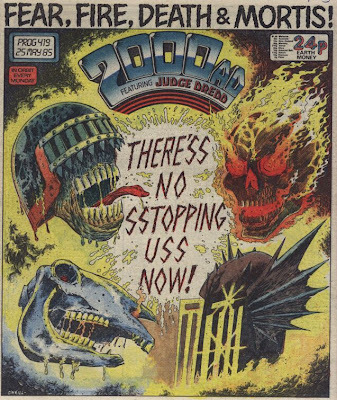 It might have been a way of dealing with reader demands for more Dark Judges and more Anderson without having to do another "Dredd fights Judge Death" story--the stakes for the first two were pitched high enough that it couldn't have been easy to find another angle. 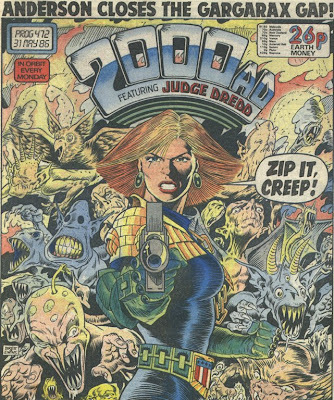 One other answer was that Judge Anderson could simply act as a second channel for Judge Dredd: adding to the backstory and moving characters into position. Anderson's first full-on serial, "Four Dark Judges," followed up on "Judge Death Lives," and established a basis for future Judge Death plots; "The Hour of the Wolf" set up the idea that the Apocalypse War wasn't so much the conclusive end of a cold war as the instigating event of a very long chain of resentment and revenge. "The Possessed" is a much less focused story, though it has one terrific switcheroo: the familiar formula its first few chapters invoke is "hero goes into terrible place to rescue an endangered innocent," and Wagner and Grant crumple up the formula and throw it away halfway through. Also, one of its throwaway jokes (the "freeplumber" bit in the third episode) seems to be a callback to a gag from a Daily Star strip a few years earlier. "The Hour of the Wolf" is probably the most dramatically effective single story here, although it's more an "ensemble of Judges who aren't Dredd" story than an Anderson feature proper--Anderson spends half of it unconscious and barely on panel. But it does establish Orlok as a significant presence in Anderson's life (that would be followed up on later) and East-Meg's exiles as an ongoing threat, and the ending reveals Cass to be a lot colder than we'd understood her to be before. After Wagner's departure from the Judge Anderson feature, though, Grant's writing takes a significant dip. 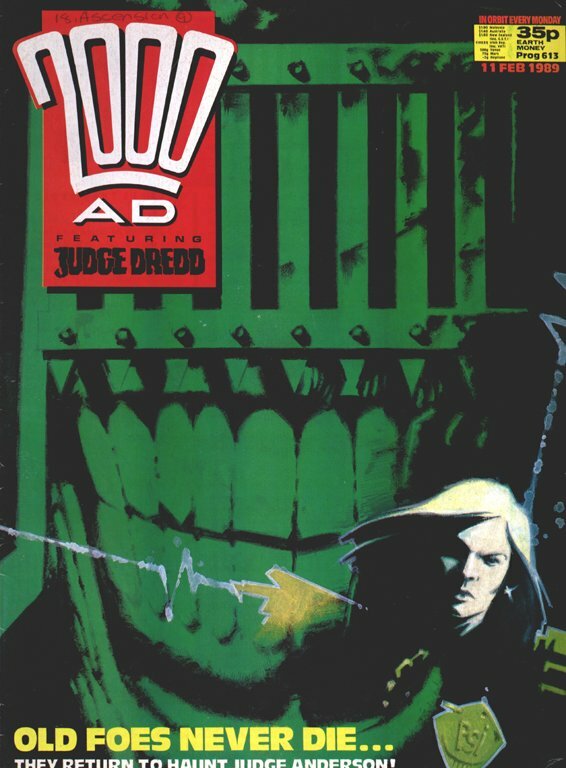 It's hard to make Anderson the focal point for satire like Dredd, so the stories don't tend to be particularly funny (the demon ram in "Triad" seems to have wandered over from a Dredd story, and seems far out of place). Anderson's not an action hero most of the time, either, and "very serious police procedurals about a psychic future cop" isn't a particularly exciting hook. And the flashes of sexiness don't quite fit either: Cass's shower scene in "Engram" just comes off as pandering. Still, the back half of the book has its moments, especially "The Random Man," which owes its premise to Luke Rhinehart's The Dice Man (there's a "Luke Reinhart Alley," sic, mentioned near the end of it). This particular story was published in 1989, three years after the unsuccessful Dice Man spinoff from 2000 AD. It was also initially published in painted color, which means the black-and-white reproduction of Carlos Ezquerra's artwork is murk city. And I really have a grudge against the final chronological story here, "Engram" (initially serialized in two halves with a 41-week gap between them). Not only does it reuse the weary old Child Abuse Is Bad And Has Terrible Effects Later On plot device from "Triad," but its title is a very dodgy piece of rhetoric. The word "engram" doesn't seem to appear in the story itself, but it's got a very specific resonance here. In neuropsychology, "engram" is a term that's not used very often, but it refers to the idea that memory is stored in the brain in some kind of physical (biological/chemical) form. The meaning of "engram" that applies to this story, though, is the one that's basically only used in Dianetics/Scientology: a repressed, painful memory that exerts power over the subconscious mind, more or less. 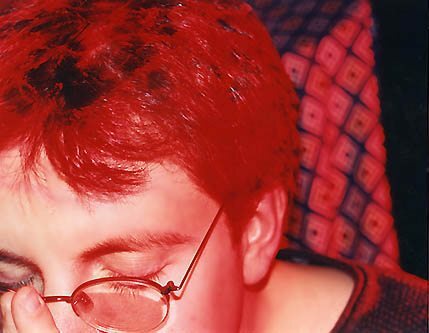 I don't know if that's what Grant intended, but it's what he ended up with. Next week: back to the Complete Case Files with Volume 8, in which Dredd suffers a failure of nerve, and Wagner and Grant take a stab at another mega-epic, then think better of it. 'The hour of the wolf' was a exciting story when it was published. There hadn't been a any references to East Meg for a long time at that point, so discovering it was a plot to free Orlok was a pretty shocking reveal at the time. Did this mean another massive war was about to start? This is a fun read, but I ain't gonna lie: i can't wait to see what you have to say about little robot bonnie. "Still, it's not clear to me as a reader why it initially seemed like having a second Judge-based series in the weekly was a good idea." 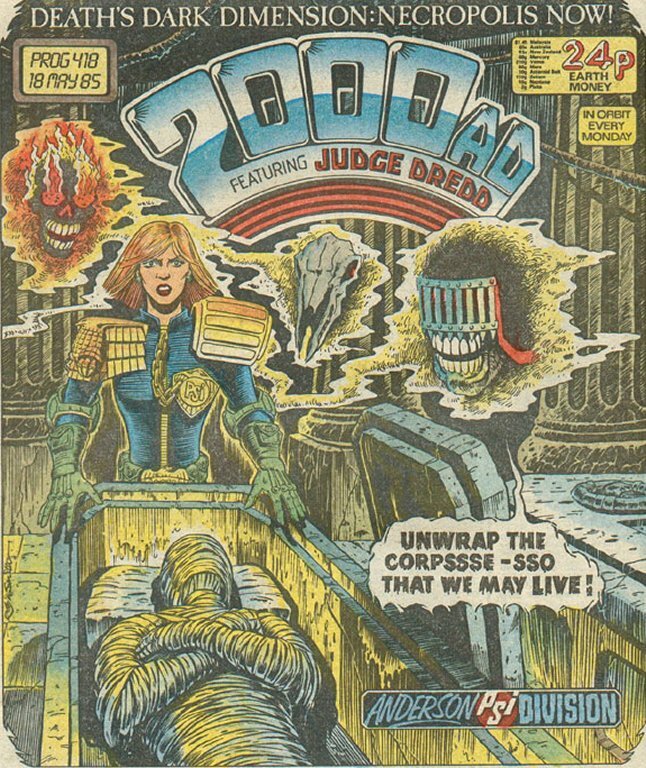 Judge Anderson started life as a comic strip for a proposed sister comic for 2000ad featuring Judge Dredd and other characters and life in Mega City One. It was mothballed but enough work had taken place on the Anderson strip that it was used in 2000ad. 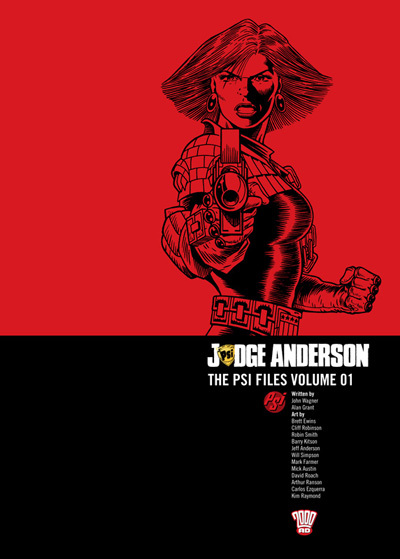 Regarding Anderson drawn in Brian Bolland's style, Brett Ewins has gone on record as saying that this was a specific request from the 2000ad editorial, and he was constantly trying to get away from the style to great criticism from editorial, and lead to his eventual departure from the strip. You should really include a review of Thrill Power Overload, a behind the scenes look at the creation and history of 2000ad, which is full of fascinating stories that would further inform the history of Judge Dredd. Yeah, Thrill Power Overload provides some essential context for these stories. Brenden McCarthy was also told to Do A Bolland, and only found his real artistic voice by Doing A McCarthy, especially when he got his hands on those groovy colours. But I always liked Brett Ewin's detailed (and duplicated) Rogue Trooper stuff, but couldn't swallow the chunky and clumsy style he evolved into.